The NDDC’s Block Head Gathering this morning was both a good time and a productive session. 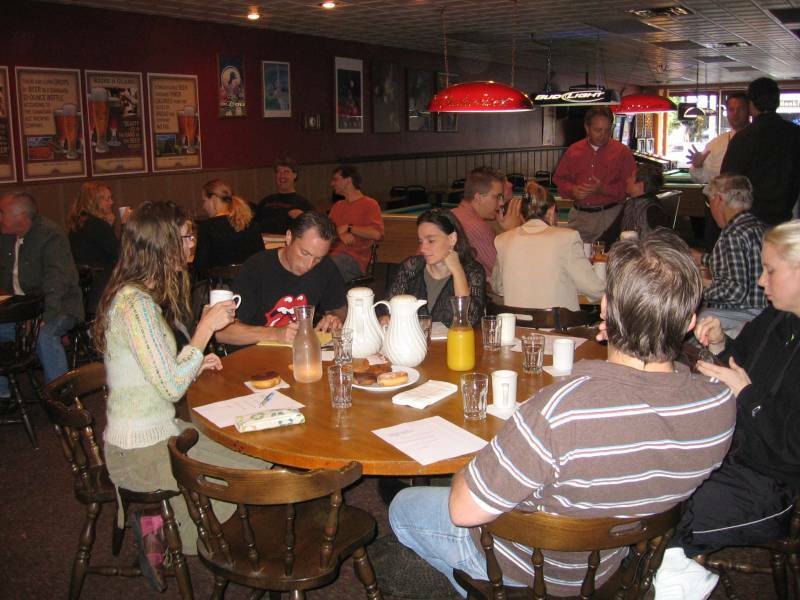 Over thirty downtown building and business owners met this morning at J. Grundy’s Rueb-N-Stein to discuss issues of interest. The group shared stories of life during the summer construction projects. Several attendees suggested that a portion of the project’s budget should address adverse impacts on businesses. EDA President Rick Estenson and City of Northfield Interim Economic Development Director Jody Gunderson said that currently the resources aren’t available but that the idea could be further explored. Both suggested that the balance between the EDA’s efforts on supporting existing businesses and recruiting future businesses in the pursuit of greater overall economic vitality is being evaluated. A number of participants offered their experiences with “Back Door Business”, including Jerry Bilek of Monkey Read, Linda Schneewind of digs and Kathy Collison of Glass Garden Beads. These are sources of income other than sales out the front door of the retail shop and include internet sales, special services and product manufacturing. Scott Taylor, Small Business Instructor from South Central College in Faribault, said that retailers now work to generate 20 to 40% of their income from these alternative lines. Several of the attendees noted that their back door business now accounts for between 20 and 50% of their income. Blake Abdella of the Northfield Enterprise Center told the group that he and his College Board of Business Consultants and Experienced Business Advisors were available to work with people on business plans. He, along with Jody Gunderson and Rick Estenson, are ready to work with businesses on structuring private and public financing. A number of potential future topics were raised, including the Outside Dining Ordinance, the Downtown Code of Conduct, ideas for a Holiday Sales Boost, accessing St. Olaf’s Fiber Backbone, and an on-line Main Street Market. The group agreed to gather again in mid-November.